After an 80-point explosion in their first meeting, what haven't these two teams seen from each other? Two months ago, the New Orleans Saints topped the Los Angeles Rams in a 45-35 Superdome shootout. That result put paid to the Rams' unbeaten streak -- and no, champagne corks didn't pop in Dolphin wet bars -- but it did put coaches and scouts on extra duty for the day they surely knew was coming. And now it's here. 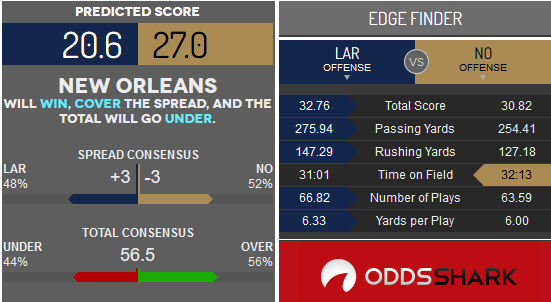 Bovada has set the line at New Orleans -3 with the total being 57 and the moneyline at Los Angeles Rams +135 and New Orleans -155. Early in the season, the Rams' offense would line up early forcing opposing defenses to line up and play their card. Seeing the deployed defense, head coach Sean McVay would talk Jared Goff through his options before the play clock ran out. Opposing defenses adjusted and disguised their defensive deployment until late in the play clock. McVay adjusted with a power rush game featuring CJ Anderson. Last Saturday in their 30-22 victory over Dallas, Todd Gurley returned from injury and was added to the mix. That was more than enough adjustment, and the Rams' defense did the rest. Even a rusty Drew Brees got the job done after a slow start against the Eagles, as the Saints were fortunate to hang on to win, 20-14. New Orleans' defense has been an unsung hero in the season's second half. They've kicked into high gear over the past few months, allowing opposing offenses to average only 16.9 points per game since Week 7. In that span, Sean Payton’s defense has collected 28 sacks. The Rams have been increasingly a ground-&-pound team against elite competition. If that trend continues, expect fewer snaps in the game with an oft-running clock. Moreover, the hostile New Orleans crowd will cause penalties and snap-count issues for the Rams, who went 6-2 under on the road this season. The Saints' question is whether Payton make the safe call and run the ball with Mark Ingram and Alvin Kamara or see Brees return to MVP-form and decimate the Rams' porous secondary? The Saints' under at home is 5-4 with the bulk of them coming late in the season thanks to that rejuvenated defense. If those trends hold, shortening the game, this one should be dramatic with the defenses doing enough to put scoring at a premium.